The water in the Earth: occurrence, water bodies, natural aqueous mixtures vs. distilled water, continental waters vs. marine waters. 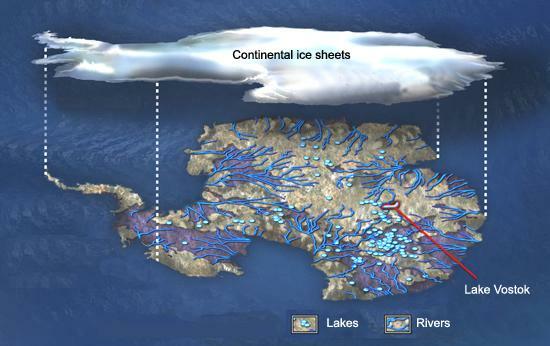 The water cycle and its reservoirs. Water and life: the roles of water in living beings and the adaptations of living beings with regards to water. 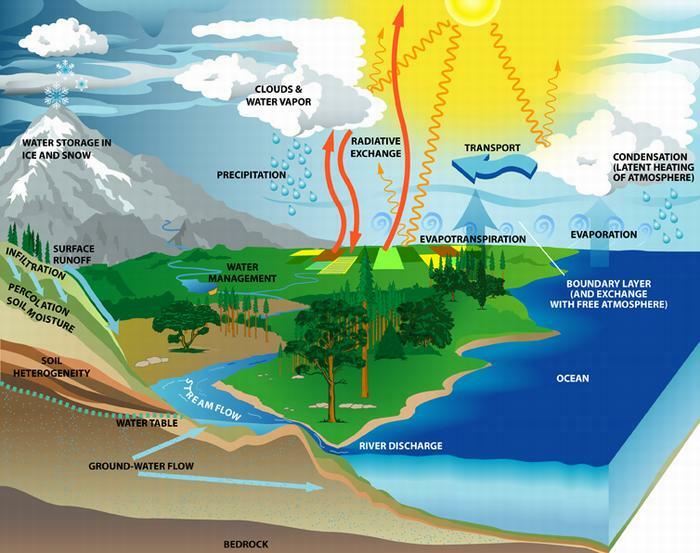 The water cycle, also known as the hydrological cycle, is the circulation of water between the different compartments or reservoirs of the Earth's Hydrosphere, involving changes in the physical state of water between liquid, solid, and gaseous phases. The water cycle is powered by the Sun's energy and the Earth's gravity. Evaporation Is the transfer of water from bodies of surface water into the atmosphere. This transfer involves a change in the physical state of water from liquid to gaseous phases, powered mainly by the solar radiation. 90% of atmospheric water comes from evaporation. 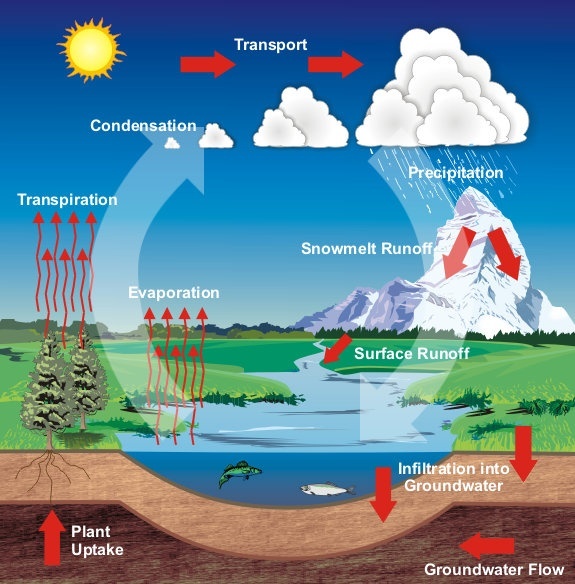 Evapotranspiration Is the transfer of water from living beings into the atmosphere. This transfer involves a change in the physical state of water from liquid to gaseous phases, powered mainly by the solar radiation and the heat released by the metabolism of the living beings. 10% of atmospheric water comes from evapotranspiration. Condensation It takes place when water vapour in the air accumulates to form liquid water droplets in clouds and fog. Precipitation Is atmospheric moisture that has previously condensed (or solidified), falling to the surface of the Earth. This happens mostly as rainfall, but also as snow, hail, or fog. Surface runoff Includes the variety of ways by which land surface water moves down slope to the oceans: snowmelt runoff to streams, streamflow, riverflow… Water flowing in streams and rivers may be delayed for a time in lakes. Much of the precipitated water evaporates before reaching the ocean or infiltrates into the soil. Infiltration Is the transition of land surface water into the ground. The infiltration rate depends on soil or rock permeability. Infiltrated water may become part of the soil moisture or accumulate in aquifers: in this case it is called groundwater. Groundwater flow Includes the movement of groundwater in aquifers. Aquifers tend to move slowly, so the water may return as surface water (into rivers, lagoons, oceans or through springs) after thousands of years in some cases. 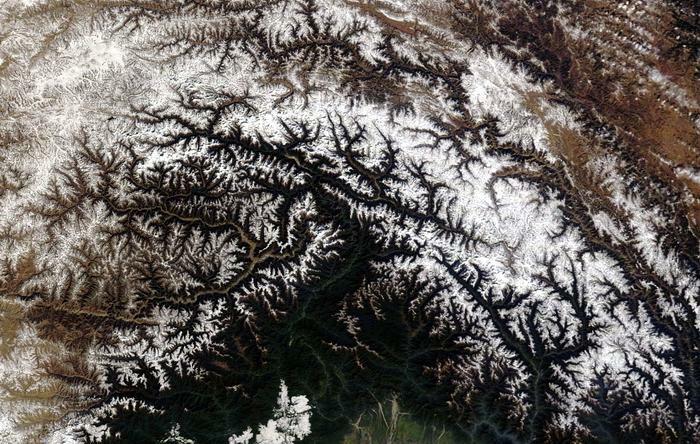 Water returns to the land surface at lower elevation than where it infiltrated. Absorption or drinking Are the ways in which soil moisture or surface water is taken in by living beings. Wikipedia: water portal.All the information about water in the Wkipedia organized in one single place, with links, news, ideas and more. Also check the "Category:Water" link in the "Categories" section to access all the articles in the Wikipedia related to water. Interactive questions and answers game.A flash animated game with 25 questions about water. You have to choose from three possible answers, and the game lets you know instantly if you have the right answer. The Hydrosphere in Geography4kids.com.Freshwater, groundwater, seawater, aquatic biomes and more. Interactive water cycle.A flash animated activity that lets you control the water cycle as you learn. 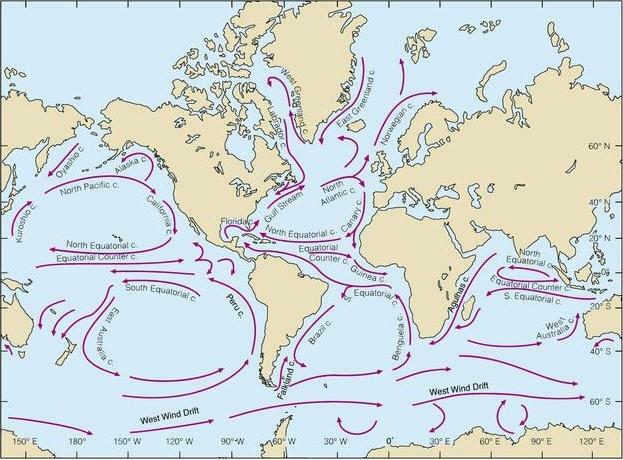 The great oceanic conveyor belt.A very clear introduction to how marine currents work. 5 really weird things about water.The most important molecule for Life is also the one that displays the most strange behaviour and properties. Learn about some of them. 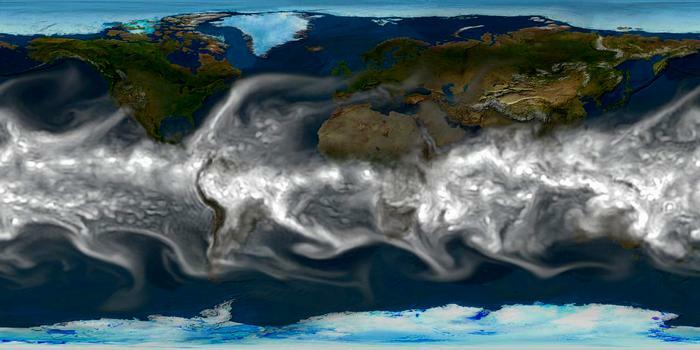 Learn which are the major ocean currents and how they circulate.